Boasting an impressive 29 storeys of luxury full-service accommodation, all of our guests will experience the oversized, spacious floor planning, top quality facilities and stylish furnishings known to Meriton Suites. Featuring 218 carefully designed suites, our guests can choose to perch themselves on the higher floors and immerse in a spectacular and breathtaking view of Sydney’s world-famous Harbour, iconic Bridge and the Opera House from the comfort of our premium Harbour Suites, as well as picturesque scenes of Kirribilli, Neutral Bay and towards the coastline right from all other suites. The only suite-hotel in North Sydney, all of our suites were designed to be up to three times bigger than a typical hotel room and come with the full-appointments of a home away from home, including internal laundries, full kitchens and large living and dining areas. Promising better value, nothing has been compromised in the two bedroom suites which are fitted with two full bathrooms and are also equipped with additional televisions in each bedroom, so our guests are able to enjoy their favourite television show or flick through a selection of Foxtel sports, movies and news channels. 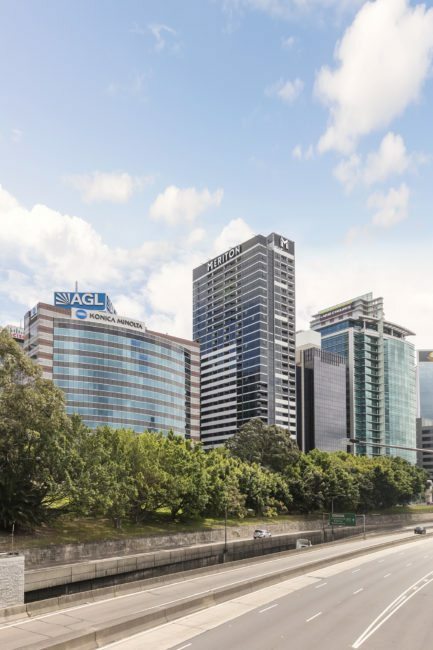 Our position in North Sydney offers a conveniently located accommodation option with the essential retail shops and supermarkets, found only moments from the front doorstep. We are surrounded by the prettiest scenery with tree-lined streets and walkways mixed in with trendy cafes, restaurants and bars. Now in partnership with Deliveroo, we are able to offer an extensive choice of meals from a selection of nearby restaurants; with all the choices growing by the day. Just like other hotels, ordering has been made as simple as a phone call down to our Guest Services team. There is also a small cafe located at the back of our hotel, as you head toward the back lane way, where you can grab a quick bite to eat and charge it back to your room.